Because we offer the best teeth whitening in Manhattan, our dental tooth whitening and professional laser teeth whitening is by far the most popular cosmetic procedures requested by our patients. There are so many whitening options now available that is possible for almost anyone to achieve a beautiful and bright smile. 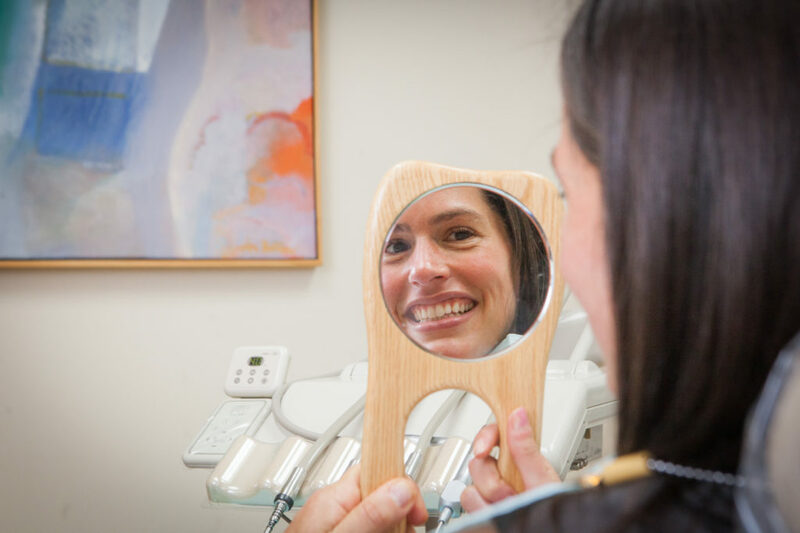 I am an expert in dental tooth whitening procedures and teeth whitening systems and will help you to decide which the best choice is for you. What is the Difference Between Tooth Bleaching and Tooth Whitening? Tooth bleaching is just another name for tooth whitening. We use hydrogen peroxide or carbamide peroxide in all tooth whitening procedures. Why Do Our Teeth Change Color as We Age? Enamel, the surface material of our teeth, is similar to porcelain, and protects our teeth from normal wear and tear. As we age the enamel can become worn and more transparent, allowing the yellow color of the core of the tooth (dentin) to show through. Millions of tiny cracks also appear and can fill up with debris resulting in a dingy, dull appearance. As NYC’s best teeth whitening dentist, our tooth bleaching and tooth whitening will remove the debris and stains but will not repair the cracks. Therefore, tooth whitening usually needs to be repeated now and then. Can Tooth Whitening Kits Remove All Kinds of Stains? Basically there are two types of tooth stains, extrinsic and intrinsic. Tooth whitening can be effective in removing both types of stains. Extrinsic stains are usually caused by normal wear or years of drinking coffee, smoking, and eating certain foods. When extrinsic stains cannot be removed by normal cleaning, then I may recommend professional tooth bleaching or tooth whitening. Intrinsic stains reside on the inside of the tooth. These types of stains are caused by aging, injury or certain minerals that may have been present during the formation of the tooth (such as the antibiotic, Tetracycline). For these types of stains I usually follow-up the in-office whitening procedure with a tooth whitening kit to be used over a long period of time. What are the Leading Causes of Tooth Staining? Age: Normal wear and the accumulation of stains can darken the teeth and make you look older than you feel. Although tooth whitening becomes more of a challenge as we age, I believe that tooth whitening can be effective at any stage of life. Natural Tooth Color: Normal teeth can range in color from yellowish to grayish. If your natural tooth color is in the yellowish range, you are probably a good candidate for professional teeth whitening. Grayish teeth are more of a challenge, however, but are not impossible to whiten. Opaqueness: All teeth have a certain level of opacity. The more opaque the tooth, the easier it is to whiten. Teeth that are less opaque (more transparent) can be a bigger challenge. Since very transparent teeth do not respond well to tooth whitening, I may recommend bonding or porcelain veneers. Diet: Your diet is probably the biggest contributor to the tooth staining. If you regularly drink red wine, coffee, tea, cola, or other deep-colored beverages, they probably have affected the color of your teeth. Very acidic foods such as citrus fruit or vinegar are also culprits because they can make the surface of the tooth porous and allow more of the dentin to show through. Smoking: Smoking is one of the leading causes of brown stains. Nicotine can penetrate deep into the tooth and make it very difficult to achieve results by tooth whitening. However, I have had tremendous success using professional tooth whitening techniques for many patients with nicotine stains. Chemicals: Tetracycline, a commonly used antibiotic, causes grey stains if used during the formation of adult teeth. Tooth whitening is sometimes effective for Tetracycline stains and I usually try it before a more invasive procedure. Tooth Grinding: Millions of people grind their teeth at night which in and of itself doesn’t cause stains, but it can cause tiny cracks to form and allow more staining to occur. As the enamel is worn away, the darker dentin shows through. Injury to the Teeth: Large cracks in teeth caused by trauma also are a cause of excessive staining. Teeth whitening techniques can be a great solution for these types of stains. In-Office, Professional Teeth Whitening System: I use a technique that usually takes only one office visit to complete. It involves the use of a highly concentrated gel that contains carbamide peroxide that is activated by a special high-intensity bleaching light. First, I protect your gums from irritation with a rubber “dam” and carefully apply the gel and turn on the light for 8-10 minute intervals until the desired whiteness is achieved. With this in-office teeth whitening system, most patients see instant, lasting results. Take-Home Tooth Whitening Kits: I always incorporate the use of these kits to help maintain the results of in-office whitening indefinitely. Take-home teeth whitening kits are very effective and cost efficient. Using a lower concentration of peroxide bleach than used in the office, you apply the gel onto a plastic tray that is designed to fit over your teeth. The gel-filled tray is then is worn every day for an hour or more (sometimes even overnight) until the desired tooth whiteness is achieved. Although this type of tooth whitening kit doesn’t provide the instant results of the in-office treatment, it may last longer and be more effective in the long run. Over-the-Counter Tooth Whitening Formulas: When tooth staining is mild, I may recommend an over-the-counter tooth whitener. Over-the-counter tooth whiteners use the same process as the professional versions, but with a much lower concentration of peroxide bleach in the gel. I am happy to help you make the decision about which professional tooth whitening procedure is right for you. Call our Manhattan dental practice at 212-685-3040 for a consultation today.